Often time patients would present with a tooth that may feel unusual, uncomfortable, or slightly painful. However, traditional X-rays do not always show the exact problem due to the fact that bone morphology and root structures may overlap each other and create inaccurate images. Stitched together from precise individual slices of images, 3 Dimensional X-rays (Cone Beam Scans) provide very detailed images which can help clinicians see exactly what is going on with the questioned site. 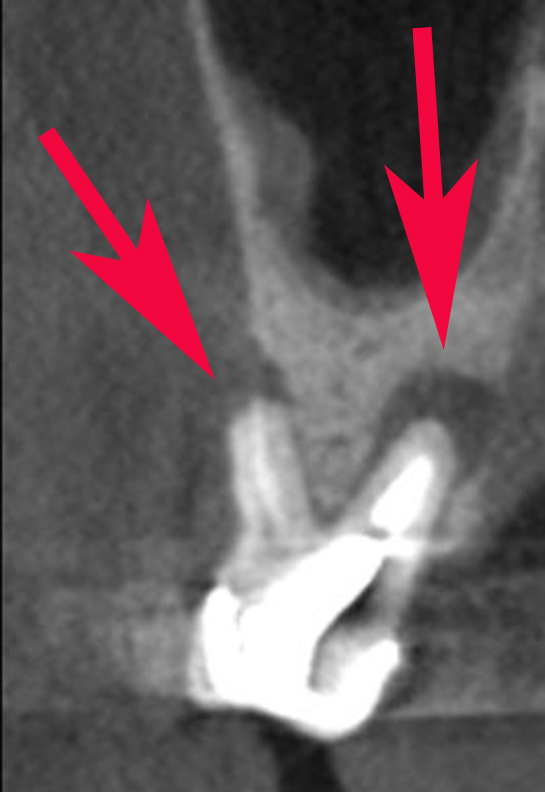 The first X-ray below shows a tooth that may have something going on at the tip of the root, yet the information is limiting and non-diagnostic. The second X-ray below is an actual slice of a 3D Scan which shows definite lack of bone support on the front side of the tooth. The image also shows slow growing infection lesions that have been dissolving the bone around the roots of the tooth. The red arrows point to the problem area. Based on the information from the 3D X-ray, this tooth cannot be saved because hanging on to it will allow further destruction of the jaw bone surrounding the tooth. Early detection of bone loss and infection can help make the treatments much more predictable, and 3D X-rays are now a very important part of our dental diagnostic tools. Traditional X-ray showing possible problem at the end of the root. A slice of a 3D X-ray showing definite bone loss and infection around the same tooth above. Digital Dentistry is Here ! Digital Dentistry is here for many different types of dental prosthesis. 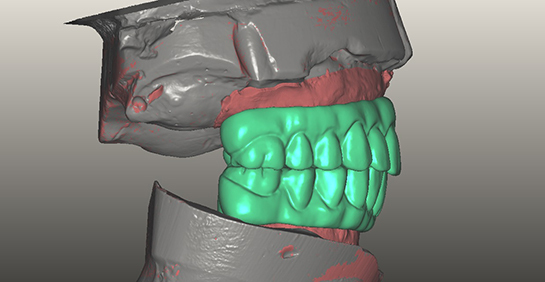 In this case we were able to convert an optical scan of the models of a denture-type prosthesis into 3D Digital images. 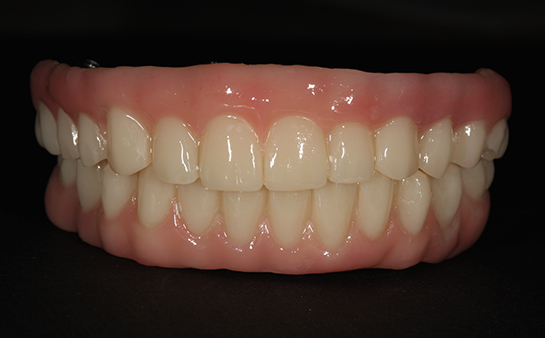 From there we modified the position of the teeth to enhance both the esthetic and functional components before milling out individual acrylic temporary prosthesis which fit precisely in the patient's mouth. The prosthesis in this case will actually be held in place by dental implants in both the upper and lower arches. By doing the refinement work digitally, we can eliminate extra appointments time required to perfect the result of all types of prosthesis. The images below came from an actual case which we will deliver to our patient next week. If you have the need for these types of implant retained prosthesis please contact our office for further information on treatment options. Digital Dentistry is a reality when it comes to dental implant treatments. Precise implant size, implant position, and the corresponding final restorations can all be preplanned using sophisticated computer softwares. Advanced planning also allows us to fabricate actual surgical guides which direct the exact locations for implant placement: The jaw is evaluated in multiple dimensions. Digital Technology allows us to take the guess work out of implant dentistry, and helps make the treatment outcome more predictable and safe. The image below illustrates an actual patient case in our office. By starting with a 3D Cone Beam scan we were able to determine what kind of restorations can be done, and where to place the implants without risks to the nerves and arteries in the patient's jaw. Infographic from the American Academy of Cosmetic Dentistry . When the nerve inside the tooth dies, it becomes a liquid and will drain out at the end of the root. In some cases the patient may not feel any pain or discomfort. However, the low grade infection will stay localized to the bone surrounding the tooth and will gradually grow over time. When enough exudates from the infection manage to dissolve an area of the jaw bone, a tract is created for the liquid to drain into the soft tissues beyond the bone. That is when the face can swell up. Periodic radiographic evaluation for decay as well as the integrity of the bone and gum surrounding each tooth is crucial in preventing this type of problem. Indeed, a diagnosis for the need of a root canal maybe presented by a dentist even when the patient does not have any pain associated with a particular tooth.